Mount’s Bay Cornwall is a beautiful bay with magnificent views out to sea and of St Michael’s Mount. This walk follows Mount’s Bay from Marazion Cornwall to Mousehole Cornwall passing through Penzance and Newlyn - allowing you to explore whilst at the same time giving your dog a good walk – an ideal day out with a dog in Cornwall (or without a dog). Dog friendly places to eat and drink are recommended along the way. You can walk the whole way or split the day between driving and walking or catch a bus, making a day which suits you (and your dog). Depending on how far you like to walk you can do all or a section of this walk (or you could drive and stop off at each place) . You can follow the path around Mount’s Bay from Marazion to Mousehole passing through Penzance and Newlyn. A lovely walk, the views across the bay are fantastic with far reaching views of the sea and St Michael’s Mount and if you are lucky you may see dolphins – pay particular attention when fishing boats are coming in towards Newlyn harbour as the Dolphins sometimes follow. From Marazion to Mousehole is about 7 miles so 14 miles if you walk there and back. If this is too far then you could break the walk up and walk from Marazion to Penzance (about 3 miles, 6 miles return) or Penzance to Newlyn (about 1 ½ miles - 3 miles return) or Penzance to Mousehole (about 3 miles – 6 miles return - you could take a bus part of the way for timetables see www.cornwallpublictransport.info). Start at Marazion Cornwall. This is a nice place to have a look around with galleries, a bakery, small shop and a number of eateries – cafes and pubs. The Godolphin Arms Marazion is very dog friendly and good for a drink, snack, lunch or evening meal. Many of the cafes are also dog friendly. 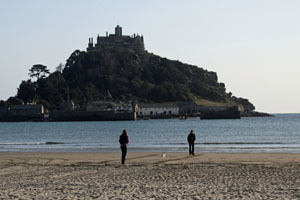 There is a large beach (seasonal dog restrictions apply) and the famous St Michael’s Mount. There is plenty of parking in Marazion although you will have to pay to park. If you walk to the Penzance side of Marazion, by the large Council car park you will find the start of the path to Penzance. The path is made path rather than field and also a cycle path in parts so dogs are best on the lead. Once you get to Long Rock the beach alongside the path is dog friendly all year and you can walk along this. Follow the path to Penzance, you will arrive in Penzance at a large car park (you could park here and walk to Marazion or Newlyn) and bus station. Walk along with the sea on your left and join the road where you can. Follow the pavement along the road across the bridge and towards the promenade. You will pass the Dolphin Tavern, good for food or a drink and very dog friendly, or on the cobbled street behind it is a dog friendly cafe. Continue along the promenade passing the Jubilee Pool, a white and blue lido designed in the 1930s by Captain F Latham, a fantastic example of 1930s architecture. Carry on towards Newlyn. Pay particular attention when fishing boats are coming in towards Newlyn harbour as the dolphins sometimes follow. As you approach Newlyn you pass a bowling green and children’s playground on your right. You then come to Wherry Town Beach on the left, a stone and pebble beach which is dog friendly all year. On entering Newlyn you will pass the Newlyn Gallery. Both the Newlyn Art Gallery and sister gallery the Exchange in Penzance have recently agreed to allow well behaved dogs and so you can stop off and view some of the art the area is so famous for. Follow the road and pavement (keeping close to the sea) through Newlyn, walk passed Newlyn Harbour, the new Penlee Lifeboat Station and up the hill leading out of Newlyn towards Mousehole. Follow the large pavement which runs alongside the road to Mousehole. You will pass the old Penlee lifeboat station with memorial to the tragic loss of the lifeboat Solomon Browne on 19th December 1981 when 8 volunteer lifeboat men from Mousehole were lost during a brave and courageous rescue attempt along with the people on board the Union Star. The village of Mousehole is a lovely quaint place to explore with cobbled narrow lanes set with granite and slate cottages spiraling out from the traditional granite walled Cornish harbour. Famous for The Mousehole Cat (maybe not getting the doggy vote! ), the beautiful Christmas Lights and Starry-Gazy Pie, Mousehole also offers galleries and eateries. The Hole Foods Deli and Cafe on the front has delicious looking offerings (we’re yet to try) and is dog friendly as is The Ship Inn pub and The Old Pilchard Place cafe. Marazion beach at Sunset. Information on Marazion Cornwall. The Jubilee Pool stands magnificently on the front at Penzance. Read more about the Jubilee Pool . Mousehole Cornwall is a picturesque harbour village on the edge of Mount's Bay Cornwall. The harbour at Newlyn Cornwall. The gardens at Penlee House Gallery Penzance are nice to walk around and there is a cafe where you can sit outside with your dog.